Queen Elizabeth The Queen Mother: The Official Biography by William Shawcross was published in hardback in 2009, six years after being commissioned by the Queen. The paperback came out in July 2010. The Queen Mother is a remarkable figure in the history of the monarchy. Born in 1900 as Elizabeth Bowes-Lyon, she married Bertie, Prince Albert the Duke of York in 1923 and became Duchess of York. When his brother, King Edward VIII, abdicated to marry Wallis Simpson, the couple and their daughters, Princesses Elizabeth and Margaret, were suddenly propelled onto the throne, something they had not expected nor wanted. As King George VI and Queen Elizabeth, they saw Britain through the Second World War and beyond, until his death in 1952. Princess Elizabeth became Queen Elizabeth II, and her mother became known as the Queen Mother until her death in 2002 at the remarkable age of 102, when she was laid to rest beside her beloved Bertie. This being the official biography, Shawcross had unparalleled access to the Royal Archives and numerous other sources in order to fully paint a portrait of a much-loved icon. He extensively quotes the Queen Mother’s letters to her family, friends and acquaintances; she was a prolific letter writer. He begins with a brief history of the Bowes-Lyon family in order to paint a picture of her family, and then covers her life in great detail from birth to death. He rarely makes assumptions: he is able to give the facts about all situations rather than deductions based on some evidence as unauthorised biographies are likely to do. The biography is well-written and flows well, making it easy to read. Shawcross is meticulous in his details, references and footnotes – to the point that in the early years, as we are introduced to many of the Queen Mother’s family and friends, the footnotes containing short biographies of each person become rather irritating yet you feel compelled to read them in case you miss something! From her childhood the Queen Mother was a character. It is really refreshing to read about her youthful mischief, and her ability to light up a room of wounded soldiers during the First World War; by the time I was born, she was an old woman in her eighties, and although she was by no means slowing down, to me she was always old, staid and old-fashioned. This biography changes that view, by continually displaying her love of life, fun and her devotion to her friends and family. However, the Queen Mother was generally regarded in her later years as being old-fashioned and opposed to change, particularly within the monarchy itself. The biography does uphold that view, although it presents her in a sympathetic light: she was brought up in a generation with fixed values and was Queen at a time when these values were still largely intact. Shawcross does always comment on her dislike of change, but always seems to present it as being acceptable and understandable. Despite the immense detail contained within this biography, there are notable gaps. The first which I noticed were related to the Second World War: only one sentence described the end of the war in the Pacific, about the American use of the atom bomb. I would have liked to know the Queen Mother’s thoughts on this action; she deplored the deaths the war brought, and had been longing for a peaceful solution right until the last minute when war was inevitable. The other war related omission was that Princess Elizabeth (now Queen) served as a mechanic in the ATS; this is a biography of her mother, but I would have expected a mention of this. Again I would have liked to hear the Queen Mother’s thoughts on this. The other glaring gap is actually a general skipping-over of the Charles/Diana/Camilla scandals. We learn that the Queen Mother was appalled when Diana spoke to the press in 1992 – it went against all her values and beliefs – but the ugliness of the divorce is only touched upon. Strange, given how close the Queen Mother was to her grandson Prince Charles. Furthermore, no mention whatsoever is made of Camilla Parker-Bowles, except a brief reference to her in relation to her husband during the 1970s. The rumour goes that the Queen Mother was so opposed to the future King having a relationship with a married/divorced woman (which presumably brought back unpleasant memories of the abdication) that Charles and Camilla could not even contemplate marriage until after her death. Rumours may be exaggerated, but I expect there is some grain of truth in it and so I was surprised to read absolutely nothing on the subject. The abdication, being a pivotal moment in the Queen Mother’s life, is covered in great detail. Shawcross is quite clearly on the side of the Royal Family through the whole mess, yet I had never realised just how bad relations between the Duke of Windsor (formerly King Edward VIII) and his family became. They refused to meet Wallis Simpson once she was Duchess of Windsor, until the Queen Mother met her following the Duke’s death. Of course the experience was traumatic for the Royal Family, however I felt the telling of the story was very one-sided. There is little focus on the incredible love the Duke felt for Mrs Simpson which caused him to do the unthinkable and abdicate; the only references to the love between them were rather nasty, referring to Mrs Simpson as “her” and how she was manipulating him to increase her own status. 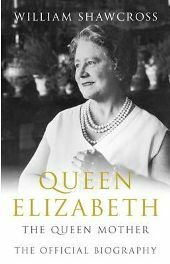 The biography is largely structured chronologically, with only two chapters being exceptions, covering the Queen Mother’s extensive patronages, hobbies, homes and routine. The more exciting part of her life was definitely the first half, up to the King’s death. After his death, when she became Queen Mother, life settled down somewhat although she never let up on her duties and work. As a result, the first half of the book is the more interesting on the whole, but as she grew into old age I really enjoyed the anecdotes about her continuing zest for life and her stamina. One particular example was on a trip to Canada in her 89th year, she paid an impromptu visit to the CN Tower. Her staff and guides were concerned about the effect the high speed lifts might have on her; she promptly made a beeline for the fastest one and was settled down with a drink at the top before the others caught up! There are many such anecdotes through the biography, which paint a very human picture of a very regal woman. One confusing factor throughout the biography is the changing of people’s titles and names. This is inevitable when reading a biography of royalty, as the titles of the Royal Family change, as do the titles of the aristocracy with whom they associate. The Queen Mother herself is the perfect example: she starts as Elizabeth Bowes-Lyon, referred to simply as Elizabeth; she becomes HRH the Duchess of York, referred to as the Duchess along with her husband the Duke; she is then Queen Elizabeth, the Queen, alongside King George VI, the King (which was how both King George V and King Edward VIII has been referred to); and then she is Queen Elizabeth the Queen Mother, referred to by both titles, with her daughter being the Queen. The sudden changes in titles can be confusing, but more so is that when an incident in the past is recalled later, the title which was in place at the time of the incident is used. Due to the length of the biography and her life, it is sometimes easy to forget that the person now referred to as the Queen Mother was once the Duchess of York. Another interesting element of the biography is the image it gives of Queen Elizabeth II. My general impression of her is as a very calm, very organised woman who is Queen above all, making Christmas broadcasts in a monotone. Having met her, she reminded me of my granny – a nice smiley little old woman, an image almost at odds with the more formal image taken from her broadcasts. When she features in this biography, she is almost always in a family setting, and so the image again contrasts with that staid official picture: she helps build a cairn at the Castle of Mey for old friends, she worries about her mother’s health, she and her sister Margaret collude to get mobility aids for the Queen Mother (who invariably refuses them). The Queen becomes a different person in the pages of this book, and that is no bad thing. Speaking of the pages of this book, you should be warned about the book itself. Amazon lists the paperback edition as having 696 pages. This is nonsense: it has 1096 pages (the last 150 are indices, family trees and a list of the Queen Mother’s patronages), along with several photo sections. The paper the book is printed on is not your average paper – it seems to be high quality and heavy. The book is VERY heavy. You can’t hold it up in your hand to read it, it needs to be resting on something. Love her or hate her, it can’t be denied that Queen Elizabeth the Queen Mother had a remarkable life and was quite a character. Despite its omissions and obvious favour towards the Queen Mother, this is an excellent biography, and is unlikely to be matched. No Comments on "Queen Elizabeth The Queen Mother: The Official Biography"